Although it appears a flat tan at the outset, this fully cut two-piece suit consists of a fine tan and cream plain weave glen check with teal blue on the outer check to create a teal windowpane effect throughout. 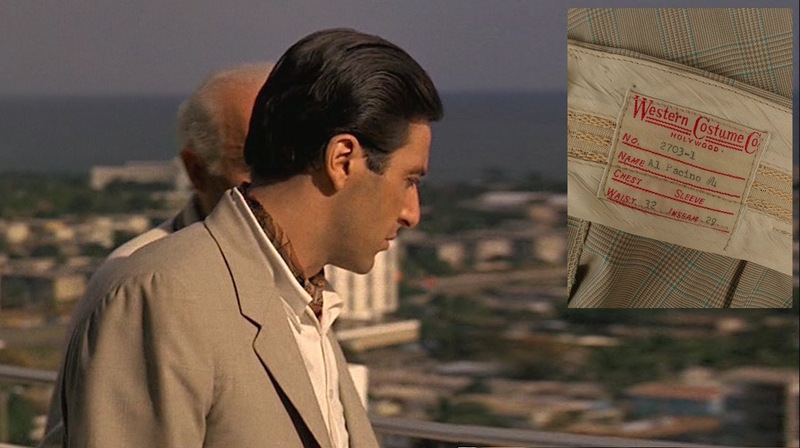 A close-up of Michael’s suit from an auction site draws out the detail of the glen check pattern. The single-breasted jacket has a 2-button front that he typically wears open, even when opting for a more formal look with a tie as he does when initially visiting Roth in Miami. The fully-cut suit coat’s padded shoulders with roped sleeveheads and ventless back is typical of the 1950s. Michael’s suit jacket has a welted breast pocket, straight flapped hip pockets, and purely decorative 3-button cuffs. The notch lapels have no buttonholes. 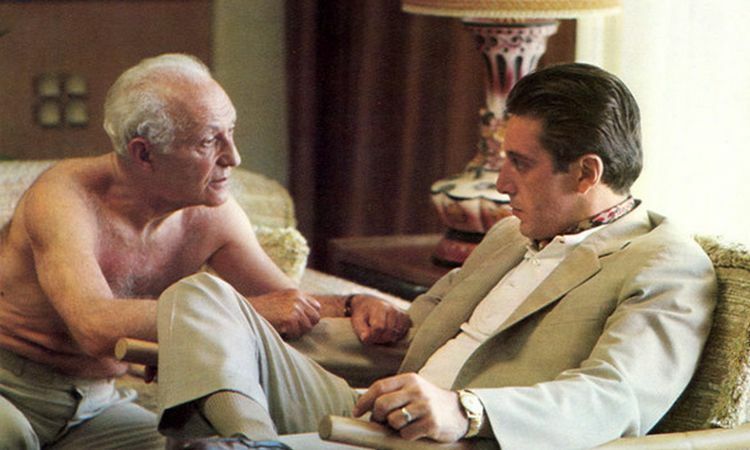 Michael wheels and deals in Hyman Roth’s hotel room. The flat front trousers have a fashionably high rise and, like the coat, are fully cut down to the cuffed bottoms. Although Michael wears a slim brown leather belt through the trousers’ outer belt loops, the auction photos also reveal that it was fitted with white buttons sewn around the inside waistband to be used for potential suspenders. The trousers close with a concealed hook at the top of a straight zip fly. The auction close-up reveals the inside of the trousers with the suspender buttons and hook closure. 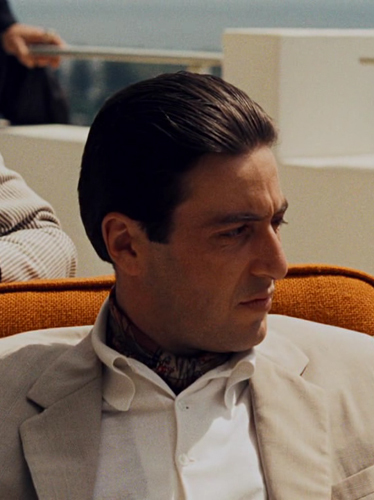 He may not be the most cosmopolitan fashion plate, but Michael Corleone knows to match his shoes to his belt. He always wears a pair of brown leather penny loafers and tan socks with this suit. 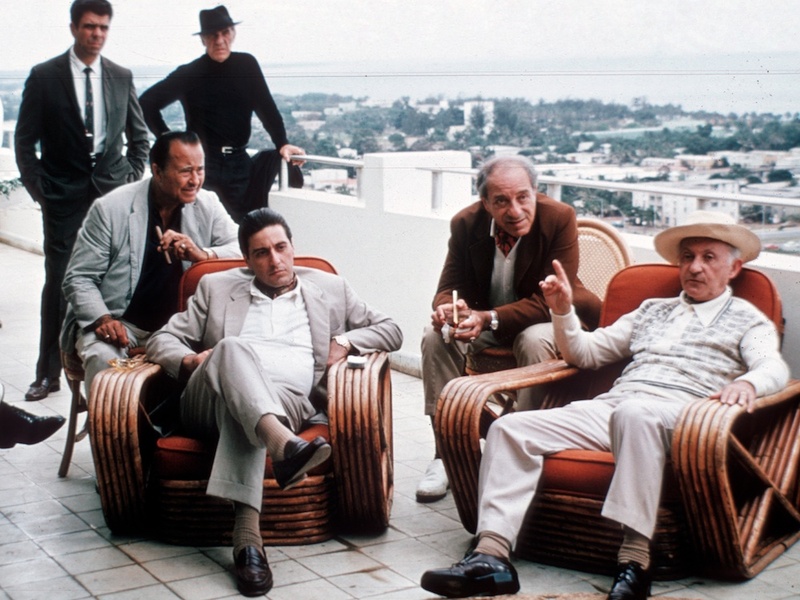 Production photo of Al Pacino and Lee Strasberg, among others, filming Hyman Roth’s birthday party… the don’t-miss event of 1958. 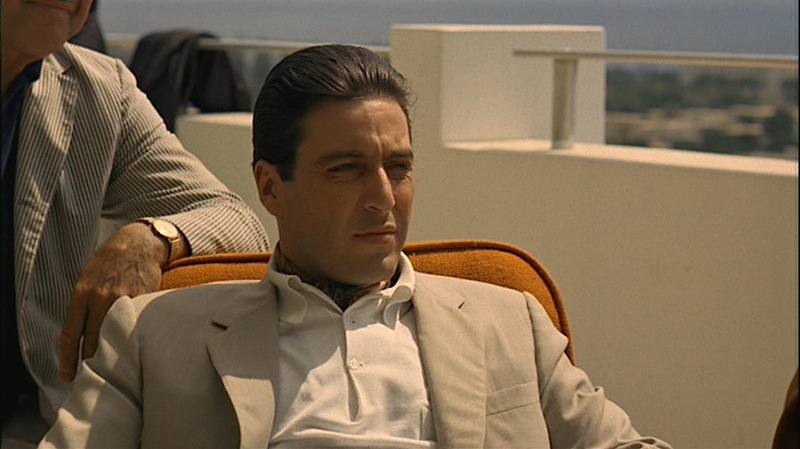 Both in Havana and Lake Tahoe, Michael makes extensive use of a day cravat worn under a polo shirt’s open collar. 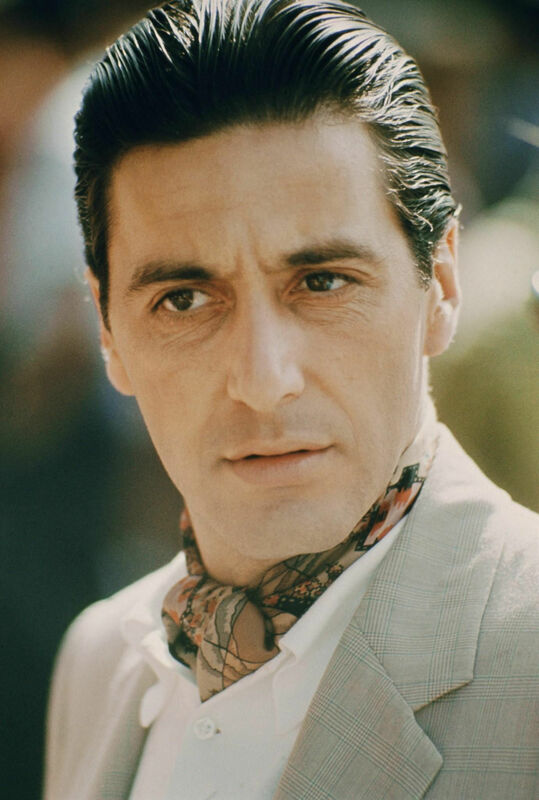 As sported by James Bond, Cary Grant, Sidney Reilly, and countless other men on holiday, the day cravat sends a clear signal that the wearer is a fashionable, confident man who is able to afford luxurious leisure. The look was also popular with nattier gangsters like “Bugsy” Siegel. In Havana, Michael wears a vibrantly printed silk day cravat in abstractly patterned earth tones like gold, bronze, and brown. Michael wears a white knit cotton short-sleeve polo shirt with a patch pocket over the left breast. The top of the three buttons is worn open to display the day cravat underneath. 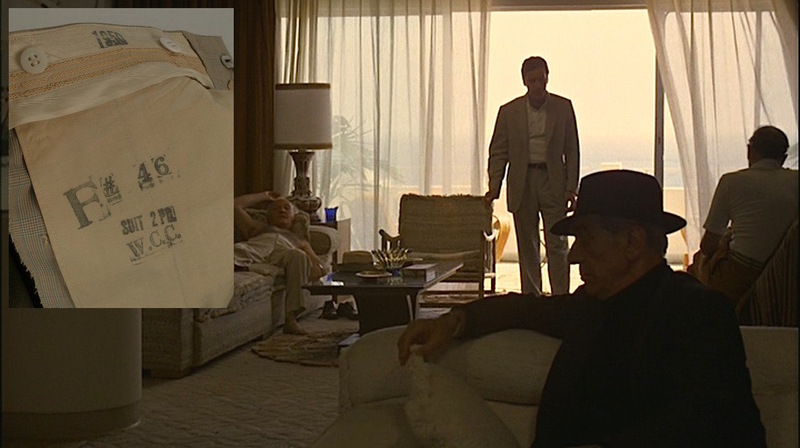 Michael breaks up Hyman Roth’s birthday party with the very unfortunate news that his fellow partygoers could all be making a very bad investment. Outside of his plain gold wedding ring, Michael’s only visible accessory is the yellow gold wristwatch on his left wrist, which some have speculated is an 18-karat Omega Constellation. 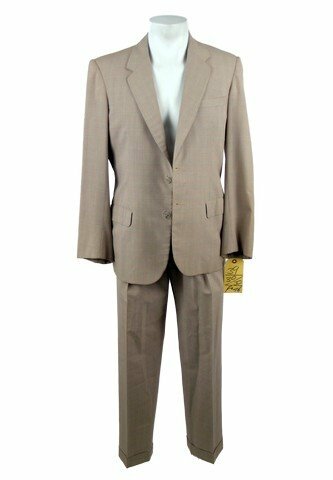 Michael Corleone’s suit, as auctioned in 2014. 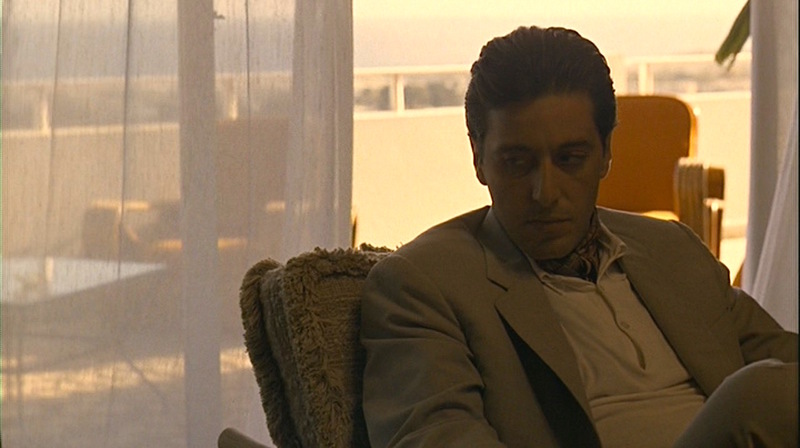 This is Al Pacino’s actual hero screen worn suit from this amazing Miami sequence. It includes both his jacket and matching pants. Both the pants and the jacket have numerous official “WCC” (Western Costume Company) stamps inside (including the period marking of “1950” on both the coat and pants), as well as the original sewn-in Western Costume Co. Hollywood wardrobe label which has the production number #2703-1, Name: Al Pacino and Waist and Inseam measurements (Waist 32/ Inseam 29) type printed on them. The iconic outfit is in excellent condition. The official labels are sewn into the inside belt seam of the pants, and inside the wallet pocket of the jacket. They were original purchased from Christie’s Auction House, and include both the original Christie tags, plus a Certificate of Authenticity signed by Breanna S. Livie, Vice President of Eastern Costume Company, as well as a Letter of Provenience handwritten by the consigner. Links to the 2014 auction site with photos and the above description can be found at icollector.com, JustCollecting.com, and Live Auctioneers. 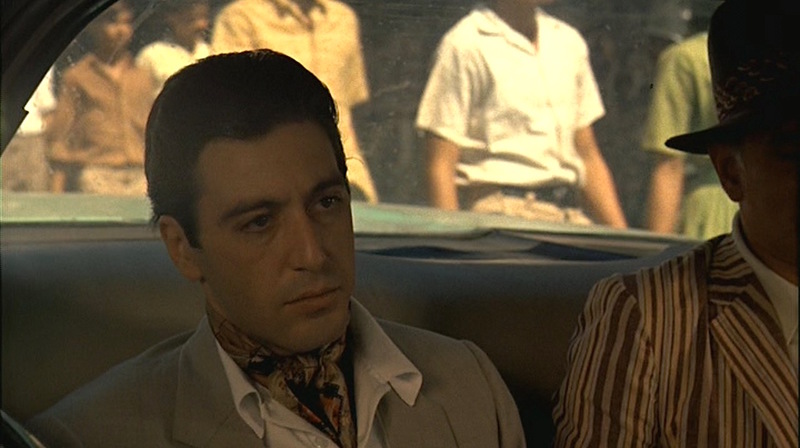 Michael Corleone breathes modern life into the traditional day cravat look by sporting it with a subtly checked summer suit and knit polo.